COMMERCIAL: Top and Bottom rails 1 1/2″ sq. 16 ga. Pickets are 3/4″ sq. 18 ga. on 4″ centers and posts are 2 1/2″ sq. 14 ga.
INDUSTRIAL: Top and bottom rails are 1 3/4″ sq. 14 ga. Pickets are 1″ sq. 14 ga. on 4″ centers and posts are 3″ sq. 12 ga.
Powderhorn Series has pickets extending through both the top and bottom rails. Finials can be added to these pickets. Powderhorn comes in a 2-Rail, 3-Rail and 4-Rail systems. Powderhorn is a galvanized coated steel fence that has been powder coated and comes with an extended warranty. Cortina Series has a flush top rail and pickets extending through the bottom rail. 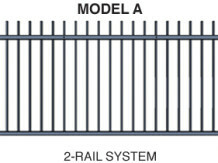 Cortina comes in a 2-Rail, 3-Rail and 4-Rail systems. 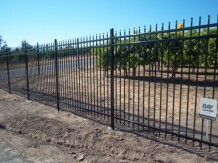 Cortina is a galvanized coated steel fence that has been powder coated and comes with an extended warranty. Stowe Series has crushed pickets that extending through the Top and Bottom rails. Stowe comes in a 2-Rail, 3-Rail and 4-Rail systems. 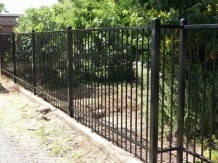 Stowe is a galvanized coated steel fence that has been powder coated and comes with an extended warranty. Vail Series has a flat bottom rail with a flat top rail. Vail comes in a 2-Rail, 3-Rail and 4-Rail system. 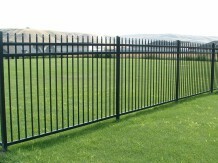 Vail is a galvanized coated steel fence that has been powder coated and come with an extended warranty. Killington Series has a Flat Bottom rail with Flat top pickets extending through the top rail. Finials can be added to these pickets. Killington comes in a 2-Rail, 3-Rail and 4-Rail systems. 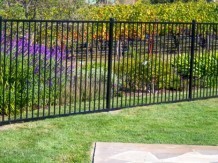 Killington is a galvanized coated steel fence that has been powder coated and comes with an extended warranty. Aspen Series has crushed pickets that extend through the top rail with a flat bottom rail. Aspen comes in a 2-Rail, 3-Rail and 4-Rail systems. 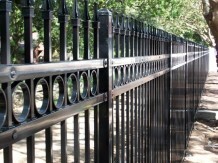 Aspen is a galvanized coated steel fence that has been powder coated and comes with an extended warranty.